This page allows a Citizen of the United Kingdom to purchase a Multiple Entry Tourist Visa for Bahrain. Valid For: 1 year The visa validity period refers to how long the visa remains active from the time that it was issued. Please ensure that you leave the country before the visa expires. Maximum Stay: 90 days The maximum stay refers to the total amount of time that you can remain in the country during a single visit. For longer stays, you would either need to consider a residents visa or leave and re-enter the country using a multiple visit visa. Processing Time: 3 business days The processing time is how long the visa would usually take to be obtained from the point at which we have received all the required documents to process your order. It does not include the time needed to post your document(s) to us or for them to be returned to you. If you intend to travel to Bahrain with dependents who are endorsed in your passport, you should not apply for an eVisa. 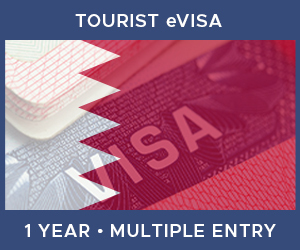 Instead, if you are eligible for an eVisa, you should travel to Bahrain, and obtain a visa on arrival. Your dependents will be included on this visa with no additional charge. Why should I choose Vital Consular? Assist with acquiring and completing all relevant documentation when applicable. Save time completing all the necessary forms. Full check of all supporting documents before visa submission. You can be assured that the visa submission is completed correctly first time avoiding delays to your travel. Liaison with the Bahrain Embassy in London for any queries and attendance where required. No more wasted time for you on the phone or in line at the Embassy. Collection, Check, Scan & Dispatch of your completed Bahrain Visa. Let us make sure everything is as expected for worry-free travel. Whilst Vital Consular is not affiliated with the Bahraini government, we have been working with the London Embassy network since 2008. You don't have to put up with unanswered calls and long queues - we do that for you. For this, our prices include a service fee to handle your Bahrain visa. In order to apply for a Bahrain Tourist Visa you will need to supply a number of items. Click on any of the icons below to learn more about each one. Passport with 6 months validity and 1 blank page. A letter from your employer to confirm that you are employed by them and the purpose of your trip. You should ensure that it includes how long you will be staying in the host country, your role within the company and who will be funding the trip. This is your flight ticket, which shows proof that you will be leaving the country on a set date. The embassy requires you to reserve a flight before applying for this visa/arriving in-country. Documents detailing your next destination, such as flight tickets, hotel booking and required visa. Required if you are travelling to a country that is not the UK after your visit.